Entrepreneur Types: This list of entrepreneur types is partly for real and partly for fun. There is a huge raft of research about what makes a successful entrepreneur, and types of entrepreneur. What I have drawn from the research is that there is no perfect personality profile of what it takes to startup a business or a nonprofit or behaviors that will lead to success. Entrepreneurship is an elusive subject. 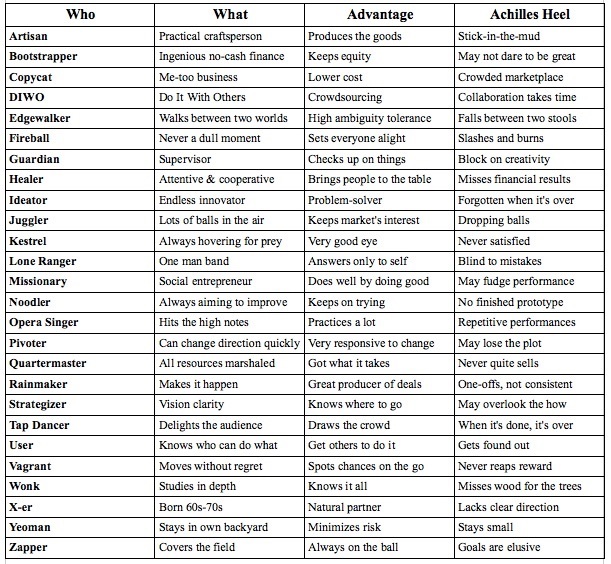 The entrepreneur types listed as an alphabet below are ones that I have observed over many years as an entrepreneur myself. Each has an advantage and each has an Achilles heel that may be an impediment to success. Or you could take this fun quiz, to what type of entrepreneur you are. It will only take you six minutes to complete. You still may none the wiser about entrepreneur types, but it will help you figure out what it is that you are doing right and what you’re doing wrong, maybe. On the other hand, my own take of what traits a successful entrepreneur is likely to possess are also described in the Venture Founders Insights listed below. You can read and compare to reach your own conclusions, to see if you fit any one of the many entrepreneur types.